Allegany Museum serves the greater Allegany Region, which includes Allegany and Garret Counties in Maryland, Mineral County in West Virginia, and Bedford and Somerset Counties in Pennsylvania. The Allegany region is geographically isolated by a range of ridges and valleys from the rest of Maryland and links us to the greater Appalachia region. Our mission is to collect the material culture of the people of the Allegany region, past and present. We look for objects, ordinary and extraordinary, whose stories and meanings are rich and complex, reflecting and challenging conventional wisdom, and inviting us to look deeper or broader. Our collections form the foundation for research, scholarship, exhibition, public programs, and outreach. Allegany Museum developed from the Western Maryland Station Center, Inc., a community group formed in 1983 to preserve, restore and renovate the Western Maryland Railroad Station. 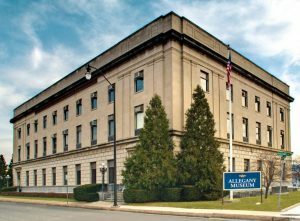 In 1999, the Museum acquired the old Post Office and Federal Court House Building at 3 Pershing Street, Cumberland. The second floor was restored and features eight exhibition areas and the grand wood-paneled courtroom which is used as an event center. The museum is currently restoring and renovating the beautiful first-floor hall of the Post Office which will house a permanent exhibition that traces the history of the National Road. Allegany Museum is a proud founding member of the Western Maryland Heritage Association. We invite you to learn about our collections, exhibitions, and educational programs and encourage you to get in touch and become part of our growing community.